Get bundles of M4V video files and want to burn them to DVD for playing on DVD players or TV? Now consider it done. In this article, you'll learn how to burn M4V to DVD without any hassles. 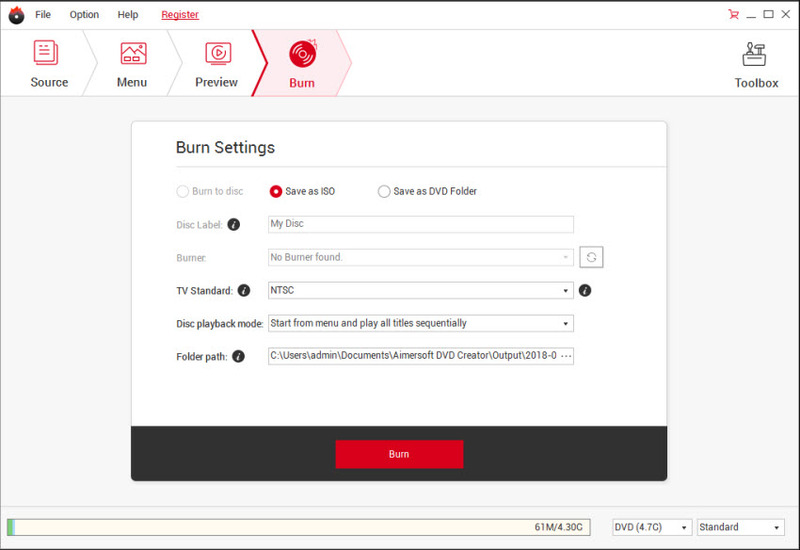 To convert M4V to DVD, a DVD burning tool is needed. Here Aimersoft DVD Maker is highly recommended to help you easily get the work done. With it, you can burn .m4v files to DVD with customized DVD menus. 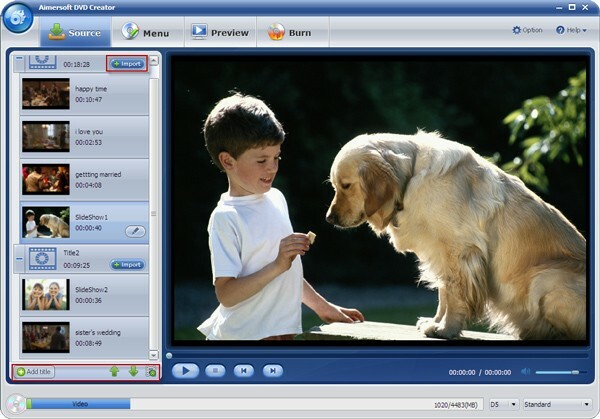 Apart from M4V, it can also create DVD from other popular video formats, including MOV, MKV, AVI, MP4, WMV, FLV, etc. If you're using a Mac and want to burn DVD from M4V on Mac OS X (Mountain Lion and Mavericks), simply turn to DVD Maker for Mac. Free download the program now and check out the guide below to view M4V videos on DVD players or TV. Note that the guide below uses DVD Creator for Windows screenshots. The way to burn M4V to DVD on Mac OS X (OS X 10.6 or later) is the same. Now you just need to make sure you've downloaded the right version. Open the program and click Import to add the M4V files you'd like to burn. Or locate the M4V videos and load them by simple drag-and-drops. In the source window of this M4V to DVD burner, you can organize DVD titles and video sequences to decide which video plays first. And as the picture below shows, all the added video files can be previewed on the right and you can adjust video volume, take snapshots, etc. as you like. The plug-in video editor allows you to edit videos by cropping, trimming, adding watermark, adjusting video effects, inserting subtitles, etc. In addition, lots of free DVD menu templates are provided, letting you create the most personalized DVDs with a professional look. You are also able to customize DVD menu background image, frames, buttons, etc. and add background music. Finally, insert a writable blank DVD disc to your computer and go to Burn tab to set the output parameters. When all settings are OK, click Burn to write the M4V files onto the DVD disc. When then burning process complete, the DVD disc will eject automatically. Then you can play M4V on DVD player effortlessly. Here is the video tutorial on burning M4V videos to DVD. M4V is a video file format developed by Apple and is used to encode movies, videos, TV shows, etc. With the rising popularity of Apple's products like iPhone, iPad, iPod, iTunes, etc., M4V videos actually can be found everywhere. Generally, M4V videos purchased from iTunes Store are protected by Apple's FairPlay DRM copy protection and can only be played on Apple products like iPhone, iPad, iPod, QuickTime, etc. with authorization. (To burn protected M4V to DVD, you need to first remove DRM from M4V and then convert the DRM-free M4V files to DVD.) M4V files from elsewhere are non-protected ones and can be recognized by a variety of non-Apple players, including VLC Media Player, Media Player Classic, RealPlayer, MPlayer and more. iTunes Movies to DVD: Do you want to burn iTunes movies to DVD to watch on TV? The tutorial can help you easily accomplish the task. Burn iPod Video to DVD: How to burn iPod videos to DVD without any hassle? Click here to find the best solution. Convert iPad Video to DVD: The articles shows you the easy steps for converting iPad videos to a DVD disc. Burn TV Shows to DVD: Have the need to burn TV shows to DVD for long-time preservation? You can follow the tutorial right now. Convert Film to DVD: Want to burn downloaded films to DVD to keep them forever? Start your task by following the tutorial. Analog Video to DVD: Converting analog videos to DVD but have no idea what to do? This article gives you the detailed instruction. Burn Photo to DVD Mac: Eager to know how to burn photos to DVD on your Mac? Get the answer right now. Convert TiVo Videos to DVD: The article tells you how to burn TiVo videos to DVD. Follow the steps to start your task. Convert Digital 8 to DVD: If you are looking for an solution to convert digital 8 tapes to DVD, you can follow the tutorial to start your task. Convert Hi8 to DVD: Looking for a method to burn Hi8 tapes to DVD discs? The tutorial shows you the easiest way.